V2 Cigs has earned 4 STARS and is RECOMMENDED with CERTAIN RESERVATIONS. We waited for our V2 Cigs Economy Kit with high hopes. We had read and viewed numerous glowing reviews about this product and they spurred us to spend the $49.95 plus shipping charges for this kit. It arrived 11 days after we placed the order. Upon opening the package, we were quickly impressed by the contents. The V2 kit contained a user manual, a three-inch 3.8-volt lithium-ion battery, an AC wall adapter, a USB charger and the cartridge/atomizers. There were five of these latter items and they came in the Cowboy flavor with 18mg nicotine strength that we had chosen. The shipping container also held an additional five cartridge/atomizers. We were also pleased to find a 15% discount card for our next purchase. We flipped through the user’s manual and looked for warnings or other information pertinent to V2 Cigs. Not finding anything, we turned to removing the plastic end caps from a cartridge/atomizer and were pleased to discover that the device also came with a plastic stopper that prevents nicotine leaks and keeps the flavor fresh. At eCigs HQ, we have always felt that e-cigarettes should taste like real cigarettes. We are not interested in chocolate or pineapple when we smoke. Then we attached the cartridge/atomizer to our battery and took a few quick drags. Each time we drew on the e-cig, the LED tip glowed a satisfying red. We exhaled an excellent cloud of white vapor. Unfortunately, all this satisfaction was punctuated with repulsion. The taste of the e-cig was terrible. Each new puff brought the same mixed results: excellent vapor and awful taste. We wanted to give the V2 Cigs the benefit of the doubt so we assumed that we had received a bad cartridge/atomizer. We tried a second and a third. Each attempt garnered the same awful result: a terrible taste that we could not get out of our nostrils. Not one of us liked it. In fact, no one even found it tolerable. This was a big disappointment. We had wanted to like these electronic cigarettes very much. This disappointment led us to consider the many positive reviews that we had read. Had all of the reviewers tried a different flavor? We had only tried one of the eight possible flavors (Cowboy, Congress, Coffee, Menthol, Vanilla, Peppermint, Chocolate and Cherry). We thought that the reviewers in questions might have been somewhat less than honest about their opinions. However, it is not our place to judge the thoughts and actions of others. We will leave it to visitors at our site to make this judgment. At eCigs HQ, we have always felt that e-cigarettes should taste like real cigarettes. We are not interested in chocolate or pineapple when we smoke. We want the authentic taste of real tobacco and nicotine. V2 does make another tobacco flavor — Congress (flavor modeled after Parliament). After talking it over, however, we decided not to try another V2 Cigs flavor. With so many electronic cigarettes to choose from, we felt that we should focus our time and energy on seeing as many different brands as we could. Separate from its upsetting taste, we thought that the $49.95 price tag on the V2 Cigs Economy Kit was a reasonable value. The kit includes a full 10 cartridge/atomizers as well as a money-back guarantee. In order to maintain a single-pack-per-day habit with V2 Cigs, we estimate that it would cost only $490.28 per year. The V2 Cigs present a superior value due to this low cost and the favorable prices for bulk orders of replacement cartridge/atomizers. Compare this expense to the cost of the same habit using real tobacco cigarettes and you can see a significant savings. A real tobacco habit of a pack-a-day would cost $2,190 per year. V2 Cigs could save such a smoker nearly $1,700. 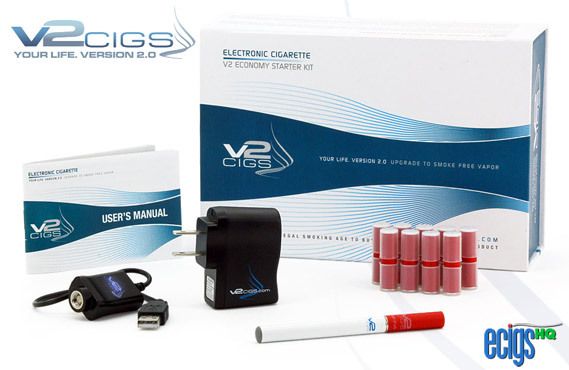 First click the V2 Cigs website link below. To receive 10% off your V2 Cigs order, enter TOP5 in the Coupon Code box at checkout.